But, before I say more about DevBase itself, let me remind you that the primary purpose of DevBase is to help us complete R3.0. DevBase is not just about code, it's also for docs and tests. While those three domains are all quite important, that last one, tests, is critical to R3 release. So, DevBase provides the main framework for doing that. I want to mention that it is not my intention to withhold general access to DevBase, but rather to work out any serious kinks first. Since the DevBase release last week, several developers have made fixes or improvements to the alpha to move it forward to the point where a broader release (beta) can soon be made. Work on DevBase is happening quickly because we are using DevBase for DevBase itself. DevBase now contains about 200 file submissions (including initial uploads, but now also components like native function headers and docs). continuing to "polish" the main interface and workflow. Alpha users are making improvements on a daily basis, with alpha 12 "shipping" today. release tag mechanism that marks the states of all components as of release, and allows for release commenting. evaluation of DevBase security. This is one of the first public tests of LNS (REBOL/Services), so we need to keep an eye on it. 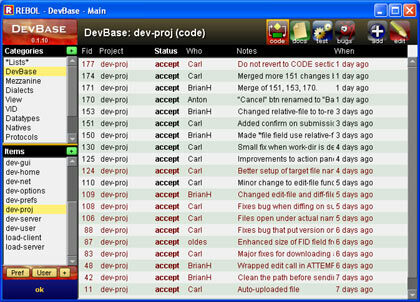 web mirroring of various parts of DevBase content, including references to the primary store (numerated files), and summaries such as the release information above. note storage - we have change history, but allowing more extensive note attachment is minor to implement, but provides a useful archive. Not a forum, but an archive. uploading various test components that need to be split up according to the structure of the DevBase items. uploading R3 C source code modules for devices and hosts into DevBase. I've been holding off until I feel it's ready. I think we're close. support from DevBase in R3 VID. That was my original plan, but we still have more work to do on VID. Most of these features are not complicated or long term. For example, the first draft of the release mechanism would require only a few hours to bring online. So, what's the time-frame for DevBase Beta release? I'm still planning on it for this month (but, this month is also full of interruptions such as the Thanksgiving holiday). So, we will see. Also, if you feel that you really want to get involved soon, it's ok with me if someone you know gives you the download URL. DevBase is self updating.